For those perfect gardeners among us, no pot of Iris seedlings ever goes a year or two too long before being separated and planted out. 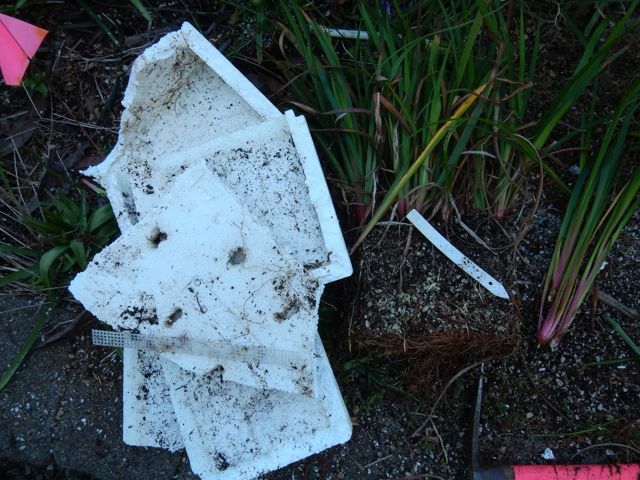 I'd like to know who they are, because this year I learned what happens when a styrofoam box of Pacifica Iris seedlings grows a year too long before division: They grow their new roots into the box walls, out the bottom and into whatever medium is beneath. 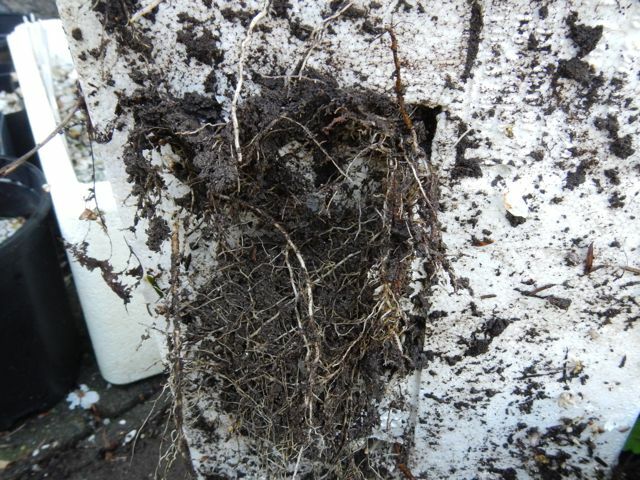 If the potting mix is to their liking, they also completely fill the mix with roots. A year past optimal planting out size, this dense mass of Pacifica Iris seedlings was not about to move to a new home easily. 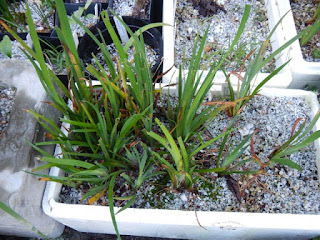 Thus, there I was on a sunny early spring day between storms, prying plants formerly seen as fragile out of what was formerly a porous and well drained potting mix of coarse perlite and half potting soil. First I tugged, then I tried to dig out some of the medium and gain some working space. A few frustrating minutes followed with very little movement towards releasing these irises from their starter home. 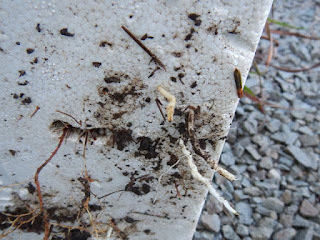 Sign of a thriving patch of Iris seedlings: roots through the box into the gravel beneath. 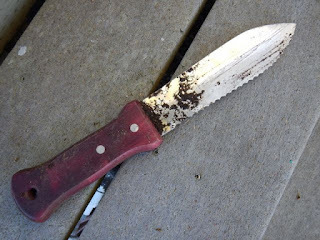 Then I resorted to my new favorite tool, a Japanese hori nori (gardening knife) and used the serrated edge to cut between plants, knowing I would cut through some. Then I got tough, and held the box down with one foot and pried with both hands. Finally, most of the soil and roots emerged in a solid mass, which I was able to cut, not pry, apart. On the second box, I simply cut it open along the corners and took the mass of roots and plants out, and then cut them apart. Then I checked the plants from last year, which will go out soon, and sure enough, these young Pacifica Iris have also grown through the box into the ground and into the walls. Only a third the size of the older seedlings, they should come out a little more easily. . .
Last year's seedlings are also ready to go, but I might not need to stand on my head to get these out, if I move them soon. There are undoubtedly some choice seedlings buried in the masses I planted––which is probably the worst of the unintended consequences. Why use styrofoam boxes for seeds? 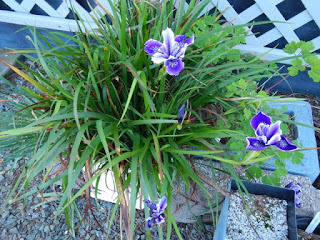 In the first few years of growing irises from seed, I found that dark plastic pots heat up in the summer, and when combined with normal summer drought, many seedlings died. I grow larger seedlings faster in styrofoam, which I deduce keeps the roots cooler. I may need to rethink the larger-faster-healthier choice and go back to slower, smaller and a little less vigorous. Or get out in the garden and repot them more promptly!